Summertime means hot weather, cold drinks, and trying not to break a sweat. Fans are essential to helping you feel cooler as temperatures start to climb. But which fan is best for your home? We’ve got the scoop on the five types of fans that are best suited for a breezy indoor air flow for your home this summer season. Looking for a gentle breeze that reaches you while you relax on the sofa, snooze in bed, or create a culinary delight in the kitchen? A pedestal fan, like the 18″ Remote Control Elegance & Performance Pedestal Fan or the 52″ Space-Saving Pedestal Fan with Remote Control, has the height to directly distribute a soft breeze whether you are standing or sitting. 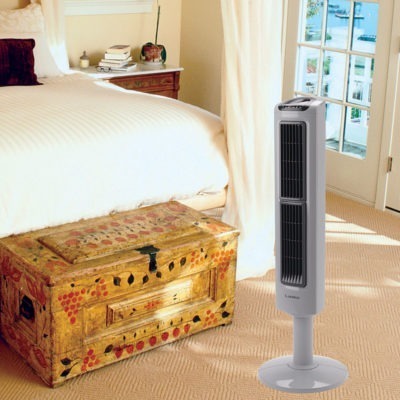 Pedestal fans stand taller than box fans or window fans, and some have adjustable heights (like the 18″ Adjustable Cyclone® Pedestal Fan, which can adapt to accommodate your preferred height). Tilt-back heads allow for a perfect air flow angle. Pedestal fans come in a variety of sizes, styles, and colors to match your home décor. Fans can work in tandem with your air conditioning to circulate cold air through the home, or they can be used on their own to promote air flow. Box fans are made to sit on the floor or countertop, and are an energy-efficient option for those looking to save on energy bills this summer. Many of our box fans use Save-Smart® technology and cost less than 2 cents per hour to run, providing high-performance air flow at a great value. There’s minimal assembly required – simply add the stabilizing feet, and place the fans wherever you need to keep things cool, such as the living room, family room, bedroom, or kitchen. Our Cool Colors 20″ Box Fans (check out that bright purple!) are ideal for kid and teen rooms, dorms, family rooms, or for any space where a pop of summery color is needed. If a bright purple or a bold blue isn’t for you, it also comes in a modern black palate. Is space at a minimum in your home? Studio apartments, dorms, high-traffic areas, narrow kitchens, entryways, and other small areas where space is at a premium will benefit from a tower fan. They’re built with a small base and narrow design – our ultra-thin Space-Saving Performance Tower Fan & Remote will fit in even the tightest of spaces so you never have to sacrifice comfort. Tower fans are a home’s interior design dream – they pack the power of traditional fans into a sleek style that blends in with most décor. The contemporary look of tower fans like the High-Reaching Tower Fan suits living spaces made for entertaining guests, and fans like the Space-Saving Performance Tower Fan offer quiet settings to converse over meals. Open windows are ideal on a warm day – until bugs fly in, or the air becomes a little too stuffy, or you have small children or pets who need watching. Window fans let you experience the benefit of a breezy open window on a warm day without the bugs or the worries. Our window fans are easy to use, providing fresh, cooling air flow in a variety of spaces. Window fans like the Electrically Reversible Twin Window Fan with Remote Control provide twin fans that work together to intake and exhaust air, keeping the room fresh and breezy. Fans like the 16″ Window Fan with E-Z-Dial Ventilation take up less space when placed in a window while still providing continuous air circulation. Some fans feature reversible airflow functions as well as adjustable thermostats so you’re always in control of how you cool off. And with multiple sizes available, you can find the perfect window fan for your home. Working from home? Playing computer games? Catching up on emails? Adding a small, personal table fan to your desktop helps keep the heat of a sweltering day at bay. Table fans are made to sit on desks, bedside tables, kitchen counters, and other flat surfaces. They are a convenient way to create a cooling breeze without being distracting. Models like the 12″ Black Performance Table Fan or the PLATINUM Desktop Wind Tower® are small and streamlined, but pack a powerful punch with pivoting air circulation and multiple quiet speed settings. A slender Air Stik® Ultra Slim Oscillating Fan or Clip Stik® Ultra Slim Desk Fan takes up very little space while still providing direct air flow where it’s needed. For formal living spaces that need a small fan, the oil-rubbed bronze finish of the 12″ Classic Metal Table Fan adds a dapper style.